He writes at home, his office an eight-by-ten space in his backyard. Inside it, he’s got an Ikea couch and a coffee table and writes sitting on the couch, his feet on the table, typing on his laptop in his lap. He always listens to music, he said, a lot of Beethoven and Bach while writing Zeitoun, when his staple of Indie rock was throwing him off. He doesn’t have internet access at home and is usually on line only twice a day, once in the morning and once at night. “You have to question every word, every adjective, and be able to prove everything. Not only that, you have to check with the subjects, Kathy and Abdulrahman, to make sure you’ve gotten it right. So it’s limiting in terms of whatever creative freedom you might seek or value as a writer. . . .
“I recommend journalism courses and/or writing for newspapers to every young writer I meet. I think there’s a discipline—that word again—that’s very valuable. And a humility. You learn to examine every last word—to be able to prove it and its worth—and to make every word count, because in newspapers you usually work within strict word limits. You learn about meeting deadlines. . . . I too enjoyed Dave Egger’s ‘Zeitoun’. 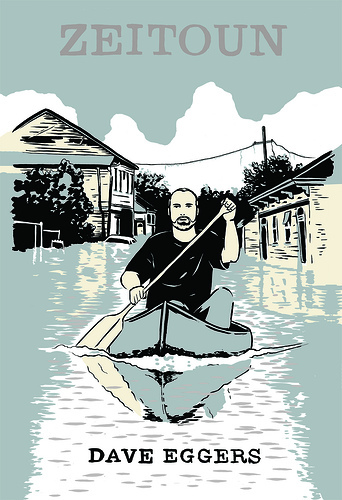 I was living out of the country during Katrina and Egger’s story brought the hardship to life for me. I find the only danger in such a strong journalistic background is a reportorial tendency that can be tedious at times if it isn’t developed as a strong creative nonfiction writer. What do you think? I agree, Beth. For personal nonfiction, especially for memoir, the narrator must be a rounded character. The goal of memoir is to render and to convey experience, and the way to do this seems to be with scenes and with a narrative persona we can understand and probably sympathize with. To tell others’ compelling stories, the writer can attempt to approximate this intimacy by using scenes and their points of view. But as Eggers’s interview comments show, it requires deep immersion in their lives and experiences. To me, this illustrates a difference between personal writing and compelling literary journalism. Eggers’s own memoir was an imaginative work—he had to re-imagine his past in order to re-experience it and to convey it. Zeitoun is an empathetic work, with its own deeply creative process, but he had to try to get the principals to remember and to re-imagine for him. I don’t think it’s lesser to do this, and it’s noble work, but brutally hard in its own way. I think this is why God created fiction. In fact, Eggers’s previous novel, What is the What, was to be nonfiction but he said his refugee subject was unable to recall his tumultuous experiences in enough detail for Eggers to recreate them. As for the narrator being a character, that can happen in a work like Zeitoun but is less common. The writer, in such cases, seems open to accusation of egotism and of getting in the way. So the omniscient narrator is often used successfully, as in fiction, whereas it usually spells doom in memoir for the main character—he or she who experiences—to be missing. Whether from my journalism background or a didactic tendency, I have had to fight against my own omniscient tendency in writing my memoir.